This is the first lapbook that we completed. 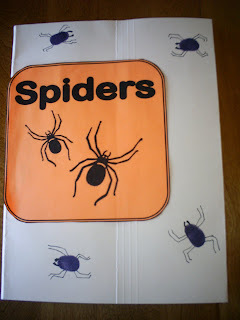 The black spiders on the file folder are Caleb's fingerprints. He drew on the legs and eyes. 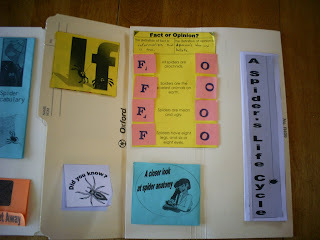 This lapbook is made up of 3 file folders put together. This is a look at the inside of the first section. Did you know that scientists say that we are never more than 3 feet away from a spider?? 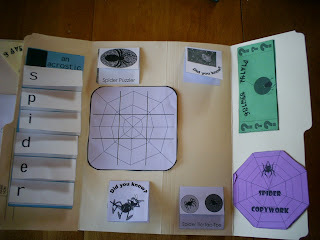 This lapbook included a variety of activities. 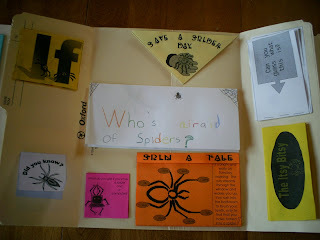 We polled our friends and family to find out who is afraid of spiders. 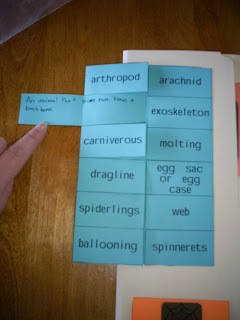 This section included a tic-tac-toe game, acrostic poem, trivia, copywork and a puzzler. The life cycle of a spider. Lots of new vocabulary words!! I really like how this little mini book turned out. It pulls out to show the answer to the question. 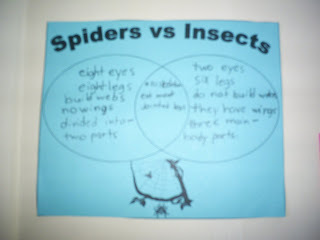 Did you know that a spider is not an insect? Great, just three feet away, huh? That's what I really wanted to hear (hee-hee!). 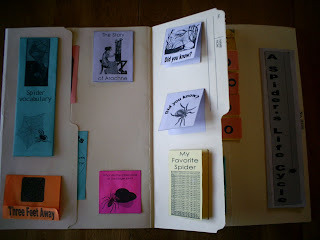 Very nice lapbook, how long did it take to organize and put together? May 7, 2008 at 9:27 a.m. Thanks Ann. :o) How long did it take us to organize and put together?...hmmmm...waaaay longer than I had hope. lol :o) I think if we do another lapbook I will pre-cut everything to speed up the process. May 7, 2008 at 10:09 p.m. 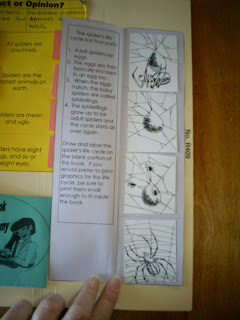 I really don't mind spiders and try to encourage the kids not to kill them! I appreciate the work they do killing flies and mosquitos which I DO dislike!! My sister, on the other hand, would FREAK OUT at the thought that they're always within three feet of her!! LOL! She's a compulsive bug/spider bomber and made sure that I'd bombed my house before they moved in a couple years ago to help with home renovations! Too funny!! June 3, 2008 at 1:59 p.m.
Oh! 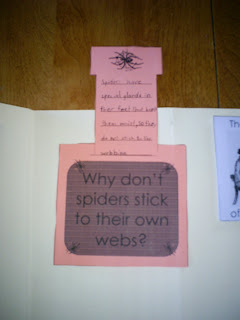 I really don't like spiders - I have nightmares about them sometimes! February 3, 2009 at 6:29 p.m.
February 24, 2010 at 11:29 p.m.